Breezing through the test of time, the simple denim jacket remains a wardrobe staple, ideal for teeming with almost anything and suited to every season and weather whim. Always in the background somewhere, the humble jeans jacket is making a big comeback this summer coming firmly to the forefront once again. Practical and stylish, denim jackets transcend fashion genres and remain a strong contender long after other items of clothing have been and gone. Once produced exclusively by a select few denim specialists, nowadays there is an overwhelming amount of choice from budget high-street options right through to expensive high-end fashion. Popular since the 1950’s, vintage shops are subsequently awash with denim jackets from across the decades and it’s easy to find your own style with a bit of a rummage. Faded 1970’s jackets are always in fashion, as are bleached styles from the 1980’s and true blue 1990’s variants. There are masses of modern spins on the timeless denim jacket and some popular summer denim jacket styles include the ever-trendy cropped versions, or those which include some form of embellishment. There is no better way to make a statement than to wear a denim jacket adorned with a little glitz and there are many variations available, including jackets which are studded, sequin heavy or embroidered. Easy to pair with a strappy sun dress and sandals, the denim jacket is perfect to keep the chill off at festivals and looks especially cool when teemed with sunglasses and a funky hat. Denim jackets look great with micro shorts and floor skimming maxi’s alike and can even work well with partywear. 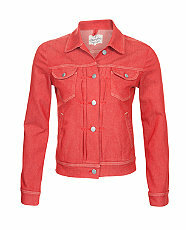 Ideal to dress up or down, denim comes in many shapes and forms and can be accessorised to give an individual look. Add statement badges or a knotted floral scarf to give a punk or feminine twist, or simply wear on its own to add a little bit of an edge. Moving away from the classic boxy denim jacket, 2013 is the ideal time to experiment with more fitted or blazer styles as well as perhaps opting for designs with differing sleeve lengths, unusual buttons or pockets which are asymmetrical or positioned differently from the standard style. A look which is expected to be popular, but not for everyone is the continuing craze for coloured denim, especially bright neon shades such as orange, turquoise and fuchsia. With so much choice when it comes to choosing a summer jacket, it’s possible not to find something perfect whatever your individual style or budget. By trying on a few different types and considering your current wardrobe, a denim jacket can instantly become a welcome addition, destined to become a much-loved staple for many years to come. Jessica Brown is a seasoned fashion writer who enjoys scouring flea markets for vintage classics. Equally interested in modern fashion, she has a fondness for all things denim and is keen to see where this year’s summer denim jacket styles will take her.